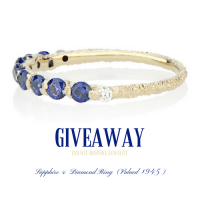 Win this stunning Sapphire and Diamond Ring custom made by designer Jayne Moore at TERNYC. Your gift: 8 Rich Blue Sapphires set in Solid Gold with dainty Diamonds to seal the deal. Using an unruly and rebellious technique known as cast in place these precious stones are set in such a way that the gold forms around the stones creating this unique earthy and textural piece that manages to be both bold and elegant and absolutely show-stopping! Each piece is a one of a kind with character and details that cant be mass produced. The lucky winner with have the ring made to their specific size. For she that dares to be different.